She didn't grow up on a farm but her uncle had a farm and she would help out when she was young. She was drawn to farming so studied to be a farm technician. She specialized in the care of pregnant and birthing farm animals and at some point found that pigs need more human intervention than other animals. That interested her—she liked that she could make a difference. She's been working on this breeding farm for 14 years. 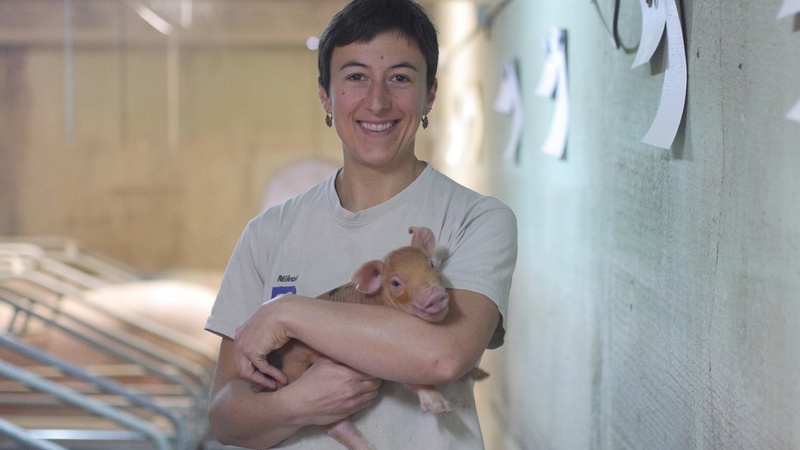 She told us that her own experience with pregnancy changed her attitude towards when to intervene with the pregnancies and delivery of the sows she worked with. Until then she had accepted her male co-workers practices. She thinks she's made a difference in the quality of life for these sows. On many occasions she explained the behaviors of the sows in terms of human maternity. Don't get me wrong, she's very matter of fact about our relationship to meat animals but at the same time she treats them with a tenderness and respect I had not expected in an operation this large. In fact, all the workers showed a tenderness to the piglets and mothers. They didn't coddle them and treat them like human babies or even like how some people pamper their pets, but there was a kindness to their interaction, an understanding that these were beings at a delicate moment in their existence and they were the people in charge of their welfare. Kate and I tried to do the math. There are 500 sows on the farm at some stage of motherhood. Each week 22-24 sows deliver litters averaging about a dozen piglets each. She takes care of these deliveries and the 264+ piglets that hang out with their mothers until they are weaned after four weeks. Okay that's taking care of 4 x 264+ piglets and their moms in the maternity sheds. And she's so nice to them and she's able to go home and take care of her family too. I took a video of Agnés tying the umbilical cords of the newborns whose cords had continued to bleed. Not only did I not know this could be a problem, but I was struck, as Kate was too, that she did it will beautifully colored purple string. This is France after all. Even pig midwives have a taste for beauty.